(C) 2014 Rethabile Frangenie Motloung. This is an open access article distributed under the terms of the Creative Commons Attribution License (CC BY 4.0), which permits unrestricted use, distribution, and reproduction in any medium, provided the original author and source are credited. Climate is frequently used to predict the outcome of species introductions based on the results from species distribution models (SDMs). However, despite the widespread use of SDMs for pre- and post-border risk assessments, data that can be used to validate predictions is often not available until after an invasion has occurred. Here we explore the potential for using historical forestry trials to assess the performance of climate-based SDMs. SDMs were parameterized based on the native range distribution of 36 Australian acacias, and predictions were compared against both the results of 150 years of government forestry trials, and current invasive distribution in southern Africa using true skill statistic, sensitivity and specificity. Classification tree analysis was used to evaluate why some Australian acacias failed in trials while others were successful. Predicted suitability was significantly related to the invaded range (sensitivity = 0.87) and success in forestry trials (sensitivity = 0.80), but forestry trial failures were under-predicted (specificity = 0.35). Notably, for forestry trials, the success in trials was greater for species invasive somewhere in the world. SDM predictions also indicate a considerable invasion potential of eight species that are currently naturalized but not yet widespread. Forestry trial data clearly provides a useful additional source of data to validate and refine SDMs in the context of risk assessment. Our study identified the climatic factors required for successful invasion of acacias, and accentuates the importance of integration of status elsewhere for risk assessment. Predicting which species will escape from forestry plantations and become invasive remains a challenge in invasion biology (Daehler et al. 2004). Such prediction is an essential requirement for proactive management (Ficetola et al. 2007). Propagule pressure, residence time, species traits, environmental factors, interactions of introduced species with the native species, and historical factors have all been indicated as drivers of invasion success (Castro-Díez et al. 2011; Křivánek et al. 2006; Lockwood et al. 2009; Pyšek et al. 2009; Thuiller et al. 2006; Wilson et al. 2007), with invasions from silviculture as no exception (Castro-Díez et al. 2011; Gallagher et al. 2011). However, climate plays a fundamental role in determining species distributions (Gaston 2003), and the predictive success of invasive risk assessments is still largely a function of invasiveness elsewhere and climate suitability (Hulme 2012). Species distribution models (SDMs) have been widely used to predict invasions (Elith and Leathwick 2009; Pauchard et al. 2004; Peterson 2003; Zhu et al. 2007). An SDM is a mathematical description of the species distribution in environmental space that can be used to predict the distribution of species in geographic space (Peterson et al. 1999). The models combine species occurrence records and environmental variables (Peterson and Holt 2003) to create a climatic envelope model. The resulting model can be projected to any geographic space to identify regions that are suitable for species. The models can be based on native distribution records, introduced distribution records, or both (Steiner et al. 2008). SDMs can therefore be used to identify areas that are suitable for species even before introduction to predict which areas are likely to be invaded (Guisan and Zimmermann 2000). SDMs have considerable potential in risk assessment but they are seldom tested in predicting successful tree establishments but see Nuñez and Medley (2011). The use of SDMs in management of invasive species can be considerably improved by independent datasets to validate SDM predictions (Allouche et al. 2006; Fielding and Bell 1997). Appropriate datasets should contain information on species that were repeatedly introduced in different localities with a clear indication of introduction outcome (i.e. success or failure). It is important that the records on introduction outcome explicitly indicate which factors influenced the outcome (e.g. climate or biotic). However, these ideal datasets are rarely available. Therefore, invaded range data have been used to evaluate SDM predictions (McGregor et al. 2012b; Nuñez and Medley 2011; Nel et al. 2004; Rouget et al. 2004; Wilson et al. 2007). However, such analyses are limited to established widespread invasive species, ignoring any failed introductions. While alien trees and shrubs have been introduced in different parts of the world to fulfil a wide range of human needs (Richardson and Rejmánek 2011), historically forestry has been one of the most important pathways (Pyšek et al. 2009; 2011). Introduced forestry species contribute to the economies of many countries, but can also cause major problems as invaders of natural and semi-natural ecosystems (Essl et al. 2010, 2011; Richardson and Rejmánek 2011). Such introductions have often been well documented, for example government forestry trials throughout southern Africa were reviewed by (Poynton 1979a, b; 2009). The data from these trials provide historical information on intentional introductions and on their outcome, making it possible to explore factors influencing the success of introductions across different areas. The aims of this study are to evaluate species distribution models using both forestry trial data and invaded range data, and to investigate why some trials succeeded while others failed. To do this, we narrowed the taxonomic range to a well studied group, Australian acacias. Australian acacias are a good model group to understand plant invasions because Acacia is a speciose genus that contains many introduced and invasive species (Richardson et al. 2011). They are also a good group for exploring SDMs because native ranges in Australia and introduced ranges in southern Africa are well known and documented (Van Wilgen et al. 2011). Around 80 Australian acacias have been introduced in southern Africa, 36 of which were included in forestry trials (Richardson et al. 2011; Poynton 2009, Table 1). Currently, sixteen Acacia species are confirmed as invasive and three species are reported to be naturalized, but it is not clear whether other species are also likely to invade or not (Richardson et al. 2010, 2011; Van Wilgen et al. 2011; Wilson et al. 2011). The number of government forestry trials, the number of successful trials; the number of records in SAPIA, the number of QDGCs occupied in South Africa, Lesotho and Swaziland; and status in southern Africa for the species explored in the study. First we used data on the outcome of forestry trials and data on invasive plant distributions to evaluate SDMs. We then assessed why some forestry trials succeeded but others failed. Lastly, we determine which introduced species have a large potentially suitable but not currently occupied range, i.e. which species have a high invasion debt (Essl et al. 2011). Species distribution models for Australian acacias were calibrated using occurrence records from their native range (Australia) and then projected to southern Africa based on Richardson et al. (2011) approach. The models were evaluated using presence records from the invaded range in the Southern African Plant Invaders Atlas (SAPIA: Henderson 2007) and records of success and failure obtained from government forestry trials (Poynton 2009). Numerous approaches have been developed to model the potential distribution of invasive species with various degrees of success (Gallien et al. 2012; Peterson 2003). Here we chose a simple SDM approach that was quick to implement. The models were originally developed for 838 Australian Acacia species (Richardson et al. 2011). The approach was slightly modified as our pilot study indicated that some of the species ranges were under-predicted when using the exact approach. Minimum and maximum values for each variable over the range of species occurrence were used to define the range of each species. We also decided to use four predictor variables instead of six as this gave more sensible predictions. The model that we produced is equivalent to the marginal range of BIOCLIM but uses only four predictor variables (Nix 1986). We obtained a dataset of occurrence records for the selected species (Table 1) from the Australian Virtual Herbarium (accessed 29th June 2010) with only one occurrence record retained per 10 minute grid cell for each species to reduce spatial sampling bias. Richardson et al. (2011) reported that to clean data all names were checked against the native species list while hybrid, varieties, subspecific information and authorities were generally removed for simplicity and to make the list comparable. The four bioclimatic variables used to build the SDMs were annual mean temperature (Bio_1), maximum temperature of the warmest month (Bio_5), minimum temperature of coldest month (Bio_6), and annual precipitation (Bio_12) all obtained at a 10 minute spatial resolution from Worldclim [www.worldclim.com (Hijmans et al. 2005)]. For each species we calculated the minimum and maximum values extracted from occurrence records for each predictor variable. These values were used to identify the range of values that each species could tolerate. For each species, we reclassified each of the four predictor variable maps into a map consisting of presence (value = 1) or absence (value = 0), using the minimum and maximum values calculated for that species. We then multiplied these presence/absence maps to generate a final map indicating the potential distribution of that species. The analysis was conducted using the R statistical software (v. 2.11, R Development Core Team 2010). The models were projected to southern Africa to identify climatically suitable regions for each species. We evaluated the relationship between predicted distributions and actual distributions (forestry trials and SAPIA data) using several measures. Sensitivity is the proportion of observed presences predicted present and quantifies the omission error; specificity is the proportion of observed absences predicted absent and quantifies commission error (Fielding and Bell 1997). These measures range from 0 to 1 with 0 indicating no agreement between predicted and actual data and 1 indicating a perfect agreement. True skill statistic (TSS) includes omission and commission errors (Allouche et al. 2006; Fielding and Bell 1997), and ranges from -1 to +1, where +1 indicates perfect agreement and values of zero or less indicates a performance no better than random. We used TSS to evaluate SDMs because TSS has been shown to be insensitive to prevalence (Allouche et al. 2006). In southern Africa, forestry trials for Australian acacias were conducted at 67 stations from the 1820s to the 1960s for 36 species (Poynton 2009). Trial data include records on introduction date (that can be used to quantify the importance of residence time in explaining invasions), and the number of stations and the number of times that a species was trialled (that can be used to quantify the effect of propagule pressure). The forestry trials dataset covers ten countries (namely, Angola, Botswana, Lesotho, Malawi, Mozambique, Namibia, South Africa, Swaziland, Zambia, and Zimbabwe), i.e. most of southern Africa. Of the 168 forestry trial records obtained from this dataset, 129 records had precise geographic location and trial outcome and could be used to evaluate the SDMs (see Table 1). While subspecific taxa can occupy different climatic niches (Thompson et al. 2011), for simplicity and as naming was not consistent or verifiable, all species that had varieties or subspecies were grouped together (e.g. plantings of Acacia longifolia subsp. longifolia and Acacia longifolia ssp. sophorae were considered jointly as Acacia longifolia). We also only analysed species with four or more trials. This gave 14 Australian acacias with which to evaluate SDMs and the relative importance of variables in explaining the outcome of the forestry trials. We quantified the accuracy of predictive power of SDMs for each species (n=14) found in forestry trials by calculating true skill statistic, sensitivity and specificity. This dataset contains records for over 700 naturalized and invasive species, with information on abundance, habitat preferences, time of introduction and distribution (Henderson 1998). Here we restricted our analyses to Lesotho, South Africa and Swaziland as the other regions are relatively poorly sampled and use the SAPIA version accessed April 2012.The accuracy of SDMs for each species (n=11) found in SAPIA was quantified by calculating sensitivity only as SAPIA is a presence only dataset. Why did some forestry trials succeed while others failed? A classification tree approach (Breiman et al. 1984) was used to identify which of several potential predictor variables could predict the outcome of forestry trials (Table 2). We considered the following variables: 1) indication of herbivory or other biotic factors (birds or hares eating seedlings as noted on the original trial record); 2) climatic suitability; 3) South African Biome; and 4) the invasive status of the species globally. The current invasive status in South Africa and global invasive status of each species were obtained from Richardson et al. (2011). Climatic suitability was coded as either suitable or unsuitable as predicted by SDMs and biotic factors [e.g. whether seeds or seedlings were eaten by hares or birds as recorded in Poynton (2009)] were coded as either yes or no depending on trial outcome. Variables used to quantify why some forestry trials of Acacia species in southern Africa succeeded while others failed. Climatic variables Bio_1, bio_5, bio_6, bio_12 Annual Mean temperature, Maximum Temperature of the Warmest Month, Minimum Temperature of the Coldest Month & Annual precipitation Did trials succeed because of precipitation and temperature ranges? Biome Names South African biomes Were trials successful because of the biomes they were introduced to? The classification tree was constructed by repeatedly splitting data, defined by a simple rule based on a single explanatory variable at each split. At each split, the data were partitioned into two exclusive groups, each of which was as homogeneous as possible (Breiman et al. 1984). An optimal tree was then determined by testing for misclassification error rates for the largest tree as well as for every smaller tree by ten-fold cross-validation constructed in CART Pro Ex v. 6.0. The program builds a nested sequence of branches by recursively snipping off the less important splits in terms of explained deviance. The length of the tree was controlled by choosing the one-SE rule, which minimizes cross-validated error within one standard error of the minimum cost tree rule (Pyšek et al. 2009). Which species that are not yet widespread have a large potential suitable range? Occupancy of each species was calculated at the quarter degree grid cell (QDGC, 15 min. × 15 min.) level. The current distribution of Australian acacias in Lesotho, South Africa, and Swaziland was based on the number of QDGCs occupied as recorded in both the SAPIA and the forestry trial databases. Species potential distribution was estimated based on climatic suitability and range size as the percentage of southern Africa (South Africa, Lesotho and Swaziland) predicted suitable by SDMs. The SDMs successfully predicted the outcome (success or failure) for 81 of the 129 forestry trials (63%) (overall TSS = 0.15, Table 3), with a high percentage of true presences predicted as present (sensitivity = 0.80) but a rather low percentage of true absences predicted as absent (specificity = 0.35). However, there was a higher proportion of false absences than false presences (Table 3). SDM evaluation varied between species, with five species having low sensitivity values and ten with low specificity values (Table 3). Measures used to evaluate models using government forestry trials dataset in southern Africa; a-number of cells for which presence was correctly predicted by the model; b- number of cells for which the species was not found but the model predicted presence; c, number of cells for which the species was found and the model predicted absence; d, number of cells for which absence was correctly predicted by the model. Sensitivity (proportion of actual presences predicted as such); specificity (proportion of actual absences predicted as such); TSS [true skill statistic (sensitivity + specificity-1]. Observed invasive ranges of Australian acacias in southern Africa are generally correctly predicted as suitable based on the SDMs (sensitivity = 0.87). However, the predictions mismatched 461 (13%) invasive range records (i.e. 13% of the records indicate that species invaded areas that are climatically unsuitable; Table 4). Most of the invasive species have the potential to substantially increase their ranges because more than half of southern Africa is predicted to be suitable. 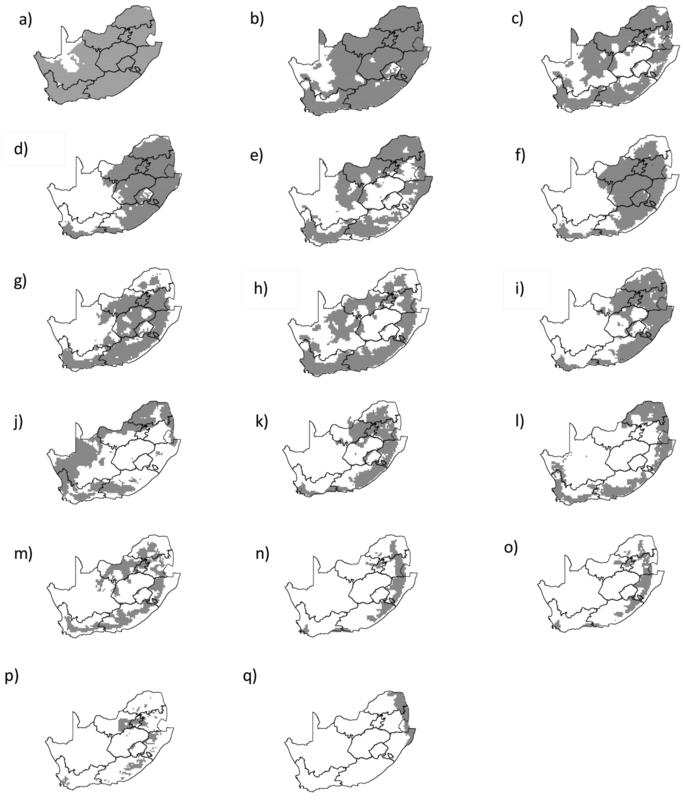 Measures used to evaluate models using Southern African Plant Invaders Atlas; a-number of cells for which presence was correctly predicted by the model; c-number of cells for which the species was found but the model predicted absence. Acacia dealbata and Acacia mearnsii are provided as visual examples (Fig. 1). Current distribution [from both forestry trials (noted as trial failure or success) and SAPIA] and potential distribution for: a Acacia dealbata and b Acacia mearnsii in Lesotho, South Africa, and Swaziland. Using climatic suitability alone, 81 trials out of 129 (model accuracy = 0.63) were correctly predicted (Table 3), while 87 (model accuracy = 0.67) records were correctly predicted by the criterion “invasive elsewhere” (Fig. 2: Node 2 and 3). Based on the classification tree (Fig. 2), three variables (invasive elsewhere, annual mean temperature, and mean temperature of the coldest month) together accurately predicted 72% of the forestry trial records (i.e. 93 trials). 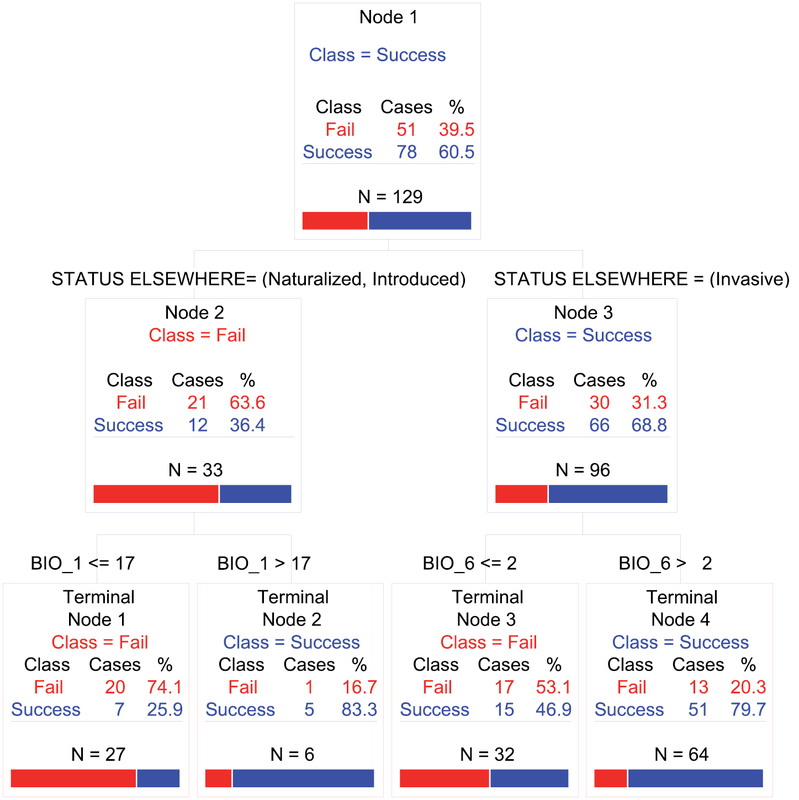 The classification tree analysis correctly predicted forestry trial outcome significantly (sensitivity = 086, specificity = 0.36 and TSS = 0.22). 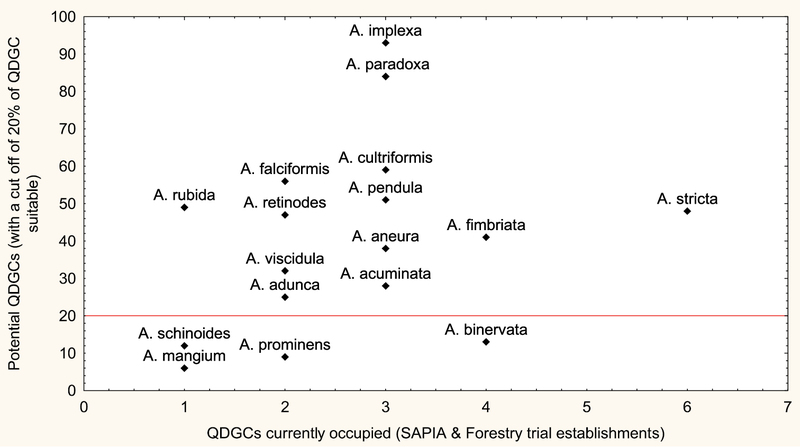 Classification tree analysis of the probability that a species will succeed (blue part of the bar) or fail (red) in southern African forestry trials based on various variables (see Table 2: trial data and variables used). Each node shows the number of successes and failures in each class, the total number of cases (N) and a graphical presentation of the percentage of success and failure cases (horizontal bar). For each node the splitting criterion is written in caps on top of the nodes. Status is similar to invasiveness elsewhere and the two environmental variables: Bio_1 is annual mean temperature and Bio_6 is minimum temperature of the coldest month. The wetter parts of the region were identified as most suitable for the analysed suite of Australian acacias. SDMs predicted that thirteen species can be widespread with 20 % of southern Africa predicted to be suitable [Acacia acuminata, Acacia adunca, Acacia aneura, Acacia cultriformis, Acacia falciformis, Acacia fimbriata, Acacia implexa, Acacia paradoxa, Acacia pendula, Acacia retinodes, Acacia rubida, Acacia stricta, and Acacia viscidula (Fig. 3)]. The remaining four species (Acacia mangium, Acacia prominens, Acacia schinoides and Acacia binervata), appear to have a potential of localized extensive spread (Fig. 3). All of these species have not yet reached the full extent of climatically suitable ranges (see Appendix – Fig. S1). The relationship between potential and current distributions in Lesotho, South Africa, and Swaziland expressed as total number of QDGCs currently occupied from SAPIA and forestry trial successes (with a cut off of 20% of southern Africa QDGCs climatically suitable) for 17 species that are not yet widespread in southern Africa. In this study, we found that forestry trial data provided useful data for SDM evaluation as it contains information on species that were repeatedly introduced in different localities within southern Africa with a clear indication of trial outcome. Trials were successful in areas that are predicted as climatically suitable by SDMs (sensitivity = 0.80; Table 3). McGregor et al. (2012b) found that successful naturalization of pine species in plantations was linked to a good climate match between their native range and introduced ranges. The results emphasize the value of incorporating forestry data in to SDMs when predicting species distributions. SDMs could not accurately predict the failures of species in trials (specificity = 0.35; Table 3) and this suggests that climatic suitability only provides a broad picture of where an introduced species might survive, but there are other factors that determine whether an introduced species will be successful like biotic interactions and evolutionary capacity to adapt (Blackburn et al. 2011; Nuñez and Medley 2011; Soberón and Peterson 2005). Factors such as seed predation, competition with local plants and herbivory can have strong effects on Acacia success in trials. SDMs correctly identified invaded ranges of Australian acacias in southern Africa. SDMs correctly predict regions of introduction but not the total invaded ranges (e.g. Acacia mearnsii, Fig. 1). Similarly, previous studies indicated that SDMs calibrated on native range records were able to predict region of introduction, but not the total invaded range, indicating a possible niche shift (Beaumont et al. 2009; Broennimann et al. 2007). This suggests that species may alter climatic niches during the invasion process. However, there is an on-going debate in literature about the prevalence of niche shift (Peterson 2011). According to the SDMs predictions, even widespread species (e.g. Acacia dealbata) have not yet fully occupied all climatically suitable areas in southern Africa. So management actions should be focused on containment, with resources dedicated to detecting and removing outlying populations of such species. In line with other studies, we found that the success of species after introduction in the new ranges was greater for species recorded as invasive elsewhere (McGregor et al. 2012a; Reichard and Hamilton 1997; Scott and Panetta 1993; Williamson and Fitter 1996). As such Australian acacias that succeeded in trials appear to be a non-random subset in the global pool: they tended to be species that are invasive elsewhere and are within climatic areas similar to their native ranges hence they are likely to invade large areas. Since Australian acacias that are known to be invasive elsewhere are already planted in southern Africa for forestry purposes (Richardson et al. 2011), their spread should be controlled. Australian Acacia species that are not yet widespread are likely to spread to currently unoccupied climatically suitable ranges as SDMs predictions indicate that a large portion of Lesotho, South Africa and Swaziland is suitable for invasion by 13 of the 17 currently introduced or naturalized (Fig. 3). We believe this is a major invasion debt and not simply an over-prediction in the SDMs, because there is a strong correlation between extent of usage and invasive distributions for Australian acacias in South Africa (Wilson et al. 2011). The widespread invaders are those species that have been planted for forestry, dune stabilization or ornamental purposes. However, many other introduced species were only ever planted in forestry trials or arboreta. As such their currently restricted distribution is the result of low propagule pressure, but given opportunities and time, these species can and do spread (Kaplan et al. 2012; Zenni et al. 2009; Kaplan et al. in press). Species that have a large potential range and are invasive elsewhere (Fig. 3 and Supplementary material Fig. S1) should be prioritised for management, and where possible eradicated, e.g. Acacia implexa, Acacia paradoxa and Acacia stricta in South Africa (Kaplan et al. 2012; Zenni et al. 2009; Kaplan et al. in press). Commercial forestry is one of the major pathways to tree invasions and availability of introduction data can be useful for screening potential invaders when coupled to SDMs. SDMs provide useful information that can influence management decisions on early detection, prioritization, and more targeted research. SDMs also provide information for rapid assessment of potential distributions of alien species based on climate, even before introduction. The project was funded by the South African Department of Environment Affairs’ Working for Water (WfW) Programme. We are grateful to Lesley Henderson and R. J. Poynton for data on Australian acacias. Mathieu Rouget acknowledges support from the South African Research Chair Initiative of the Department of Science and Technology and National Research Foundation of South Africa. Allouche O, Tsoar A, Kadmon R (2006) Assessing the accuracy of species distribution models: Prevalence, kappa and the true skill statistic (TSS). Journal of Applied Ecology 43: 1223–1232. doi: 10.1111/j.1365-2664.2006.01214.x. Beaumont LJ, Gallagher RV, Thuiller W, Downey PO, Leishman MR, Hughes L (2009) Different climatic envelopes among invasive populations may lead to underestimations of current and future biological invasions. Diversity and Distributions 15: 409-420. doi: 10.1111/j.1472-4642.2008.00547.x. Breiman L, Friedman J, Olshen R, Stone C (1984) Classification and Regression Trees. Wadsworth, 358 pp. Gaston KJ (2003) The structure and dynamics of geographic ranges. Oxford University Press, Oxford University UK, 260 pp. Henderson L (1998) Southern African Plant Invaders Atlas (SAPIA). Applied Plant Science 12: 31-32. Henderson L (2007) Invasive, naturalized and casual alien plants in southern Africa: A summary based on the Southern African Plant Invaders Atlas (SAPIA). Bothalia 37: 215-248. Kaplan H, van Niekerk A, Le Roux JJ, Richardson DM, Wilson JRU (in press) Incorporating risk mapping at multiple spatial scales into eradication management plans. Biological Invasions. Mucina L, Rutherford MC (2006) The vegetation of South Africa, Lesotho and Swaziland. South African National Biodiversity Institute, 808 pp. Nel JL, Richardson DM, Rouget M, Mgidi TN, Mdzeke N, Le Maitre DC, Van Wilgen BW, Schonegevel L, Henderson L, Neser S (2004) A proposed classification of invasive alien plant species in South Africa: Towards prioritizing species and areas for management action. South African Journal of Science 100: 53-64. Nix HA (1986) A biogeographic analysis of Australian elapid snakes. In: Longmore R (Ed). Atlas of Elapid Snakes of Australia. Australian Government Publications Service, Cranberra: 4-15. Poynton RJ (1979a) Tree Planting in Southern Africa. The Eucalypts. Department of Forestry Pretoria. South Africa, 882 pp. Poynton RJ (1979b) Tree Planting in Southern Africa. The Pines. Department of Forestry Pretoria, South Africa, 576 pp. Poynton RJ (2009) Tree Planting in Southern Africa: Other Genera. Deapartment of Forestry Pretoria, South Africa, 773 pp. Pyšek P, Jarošík V, Pergl J (2011) Alien plants introduced by different pathways differ in invasion success: Unintentional introductions as a threat to natural areas. PLoS ONE 6: 1–11. art. no. e24890. R Development Core Team (2008) R: a language and environment for statistical computing. Version 2.8.1. R Foundation for Statistical Computing, Vienna. Soberón J, Peterson A.T (2005) Interpretation of Models of Fundamental Ecological Niches and Species Distributional Areas. Biodiversity Informatics 2: 1-10. Current and potential distributions of sixteen species that are not widespread in southern Africa arranged on the basis of their suitable range size : a Acacia paradoxa b Acacia implexa c Acacia cultriformis d Acacia falciformis e Acacia pendula f Acacia rubida g Acacia stricta h Acacia retinodes i Acacia fimbriata j Acacia aneura k Acacia viscidula l Acacia acuminata m Acacia adunca n Acacia binervata o Acacia schinoides p Acacia prominens q Acacia mangium. The grey shading indicates areas that SDMs have identified as suitable by SDMs while the white shading indicates unsuitable areas.